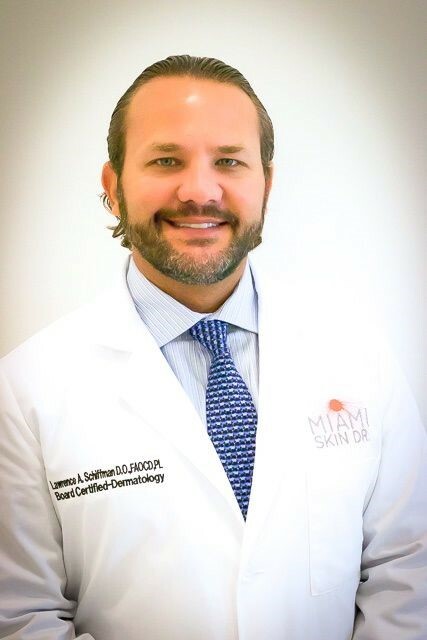 About Us | Miami Skin Dr.
Lawrence A. Schiffman D.O., FAOCD is a Board Certified - General, Surgical & Cosmetic Dermatologist. He specializes in all disorders of the skin, hair and nails. Dr. Schiffman maintains a modern, state-of-the-art, digital Dermatology practice located in the heart of Doral, Florida. The office is located within the Pavilion at Doral, a class- A medical office building with convenient access to most major highways and ample parking. At Miami Skin Dr., we strive to provide the highest quality of patient care. We value your business and appreciate you choosing Miami Skin Dr. for your medical and cosmetic needs.? During his academic studies, Dr. Schiffman volunteered his time as the national director of AIDS awareness to promote increased awareness of sexually transmitted diseases and AIDS. Through this experience, he became recognized nationally as a public speaker and educator. He has published numerous articles in various medical journals throughout his career and presents lectures often. Prior to his residency, Dr. Schiffman completed a 4-year combined Dermatology/Tele-dermatology fellowship at Derm Dx Centers for Dermatology in northeast Pennsylvania. During that time, he utilized tele-dermatology to provide dermatological services to the inmate population of the Federal prison system. Currently, Dr. Schiffman is at the forefront of international tele-dermatology initiatives, providing services to the cruise line industry. Finally, Dr. Schiffman maintains active membership in numerous state and national medical associations including the American Osteopathic Association and the American Medical Association as well as many dermatological societies. He is board certified in dermatology through the American Osteopathic Board of Dermatology. He is a clinical instructor of dermatology for both students and residents in the South Florida region. He maintains affiliations with Baptist Hospital, South Miami Hospital, Westchester General Hospital, and Larkin Community Hospital. Dr. Schiffman is in private practice in Doral, Florida, a bustling community in the heart of Miami. His practice, Miami Skin Dr., provides dermatological care to the diverse, growing residents of this thriving city.